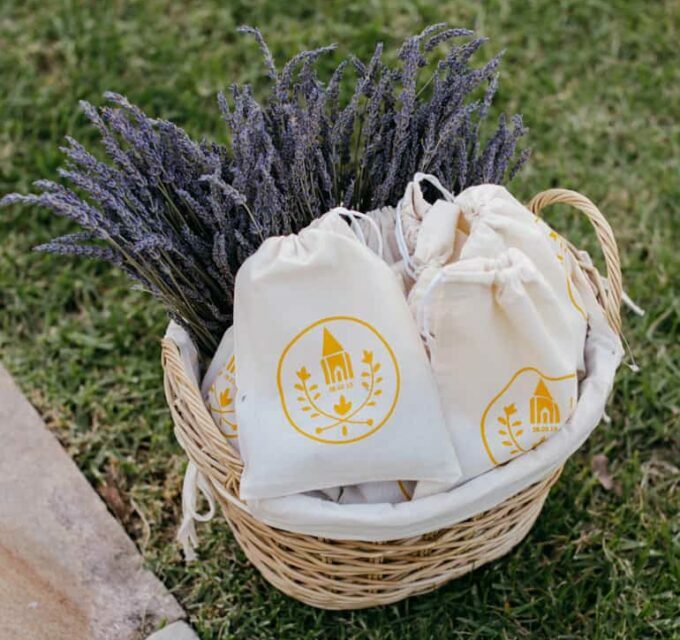 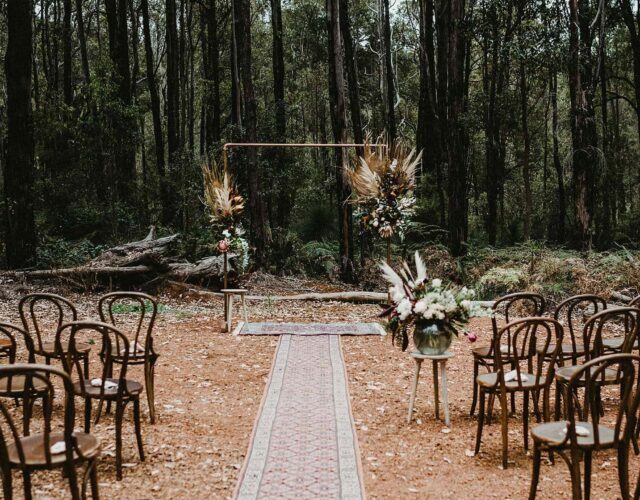 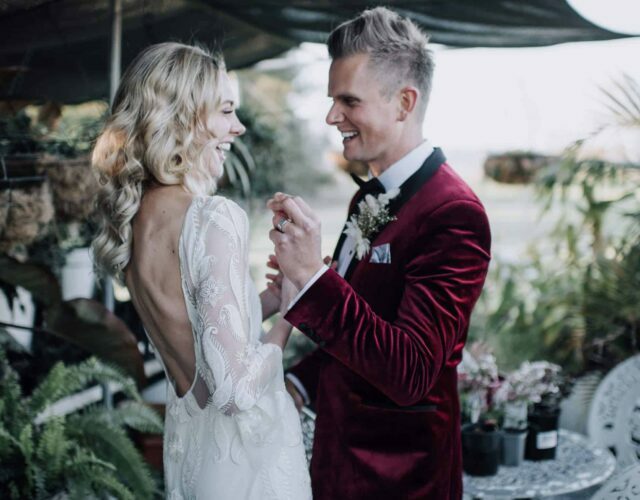 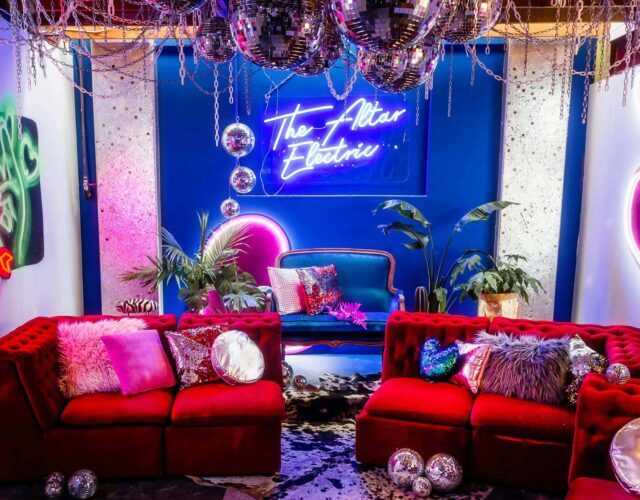 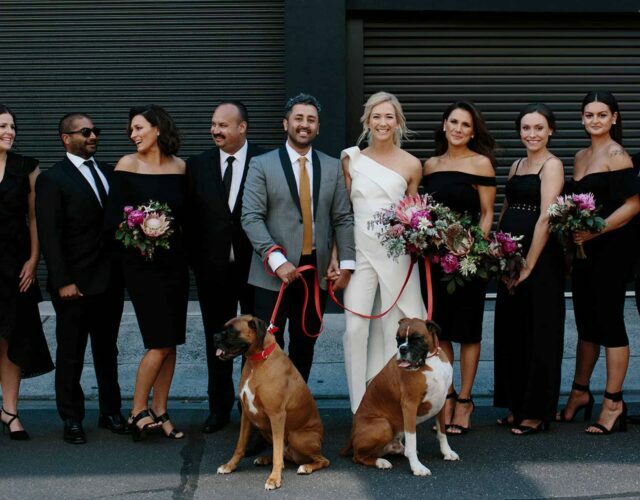 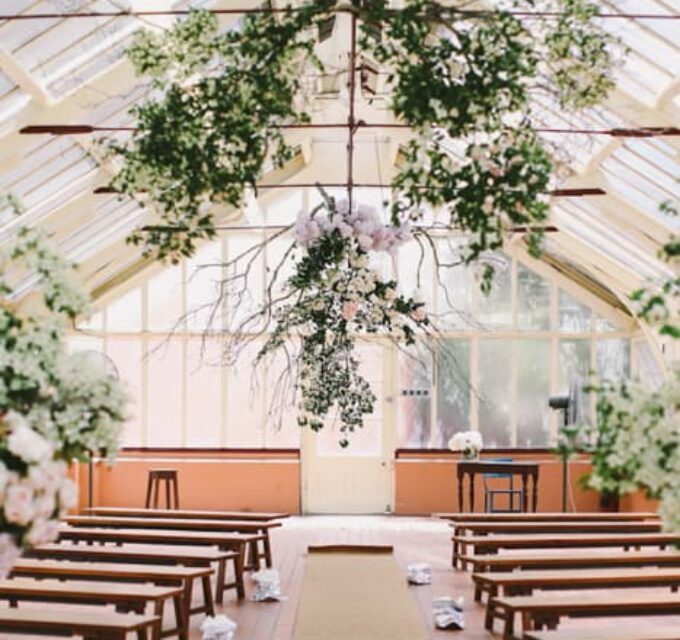 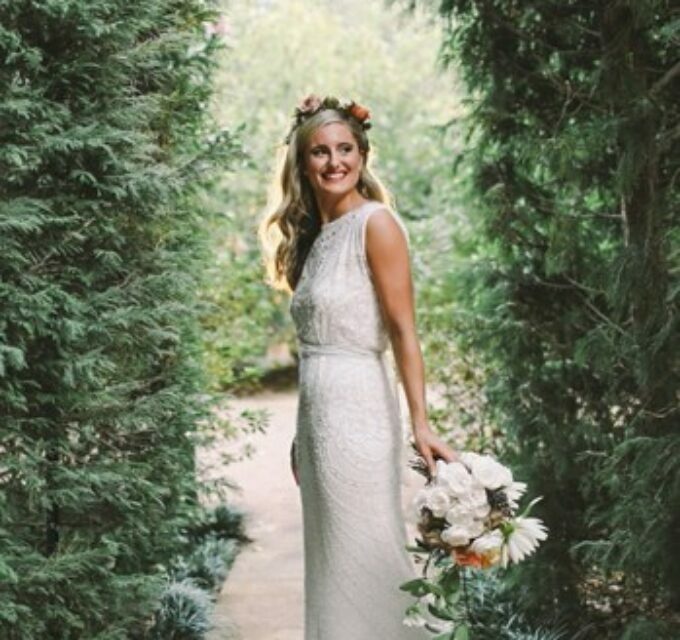 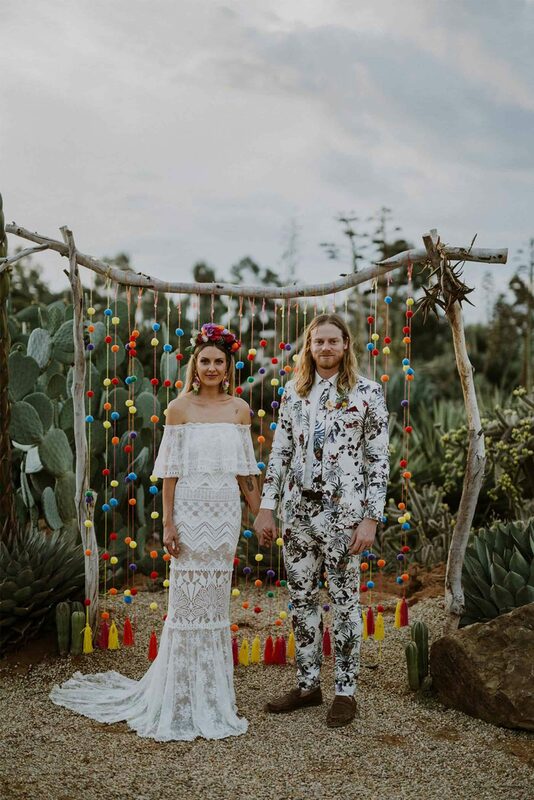 12 Weddings that Nailed Pinterest’s trend of 2019... 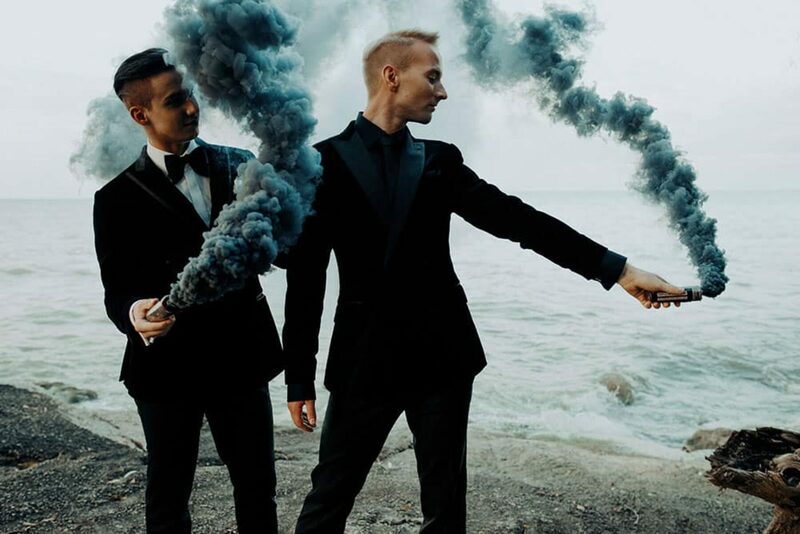 Smoke Bombs! 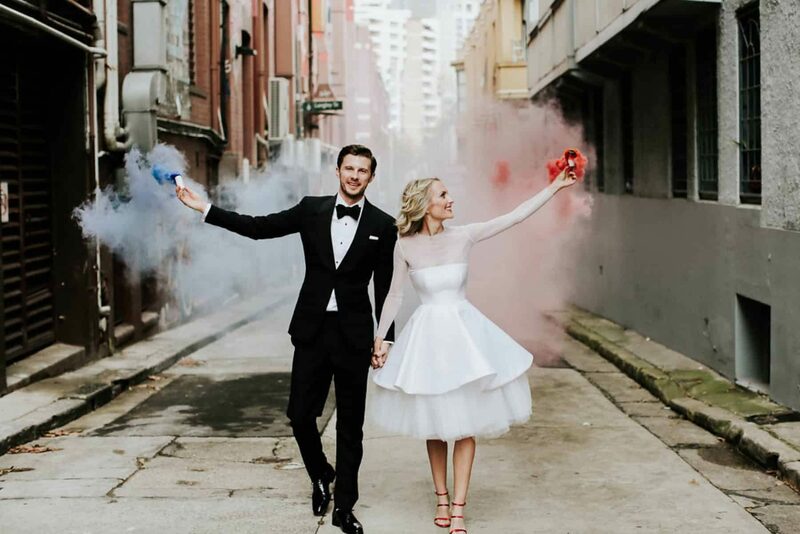 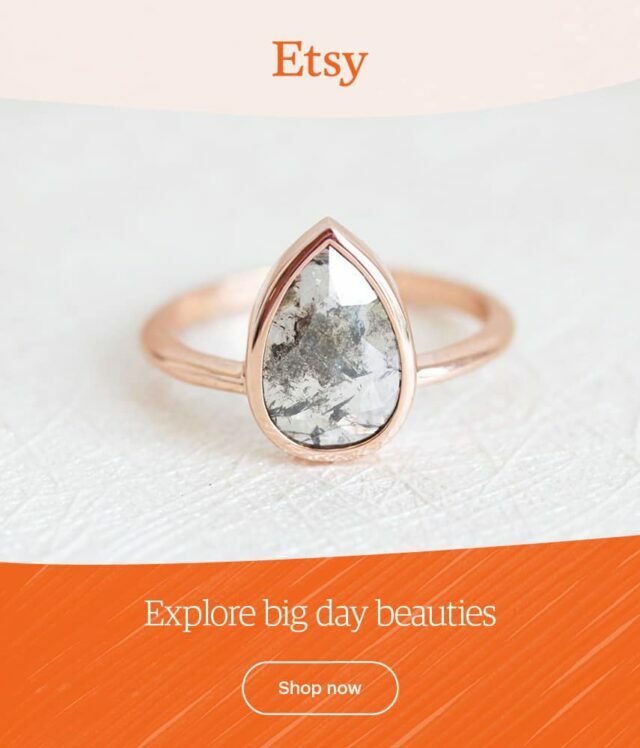 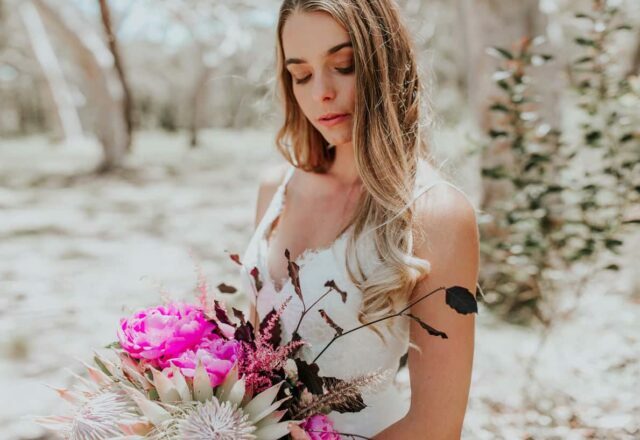 - nouba.com.au - 12 Weddings that Nailed Pinterest’s trend of 2019… Smoke Bombs! 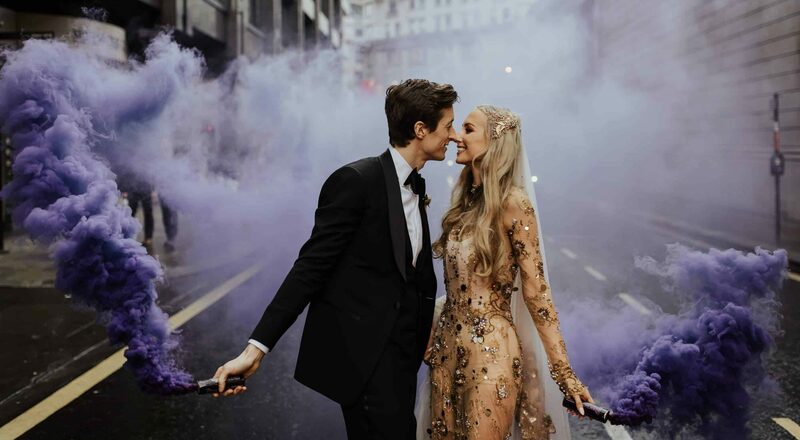 12 Weddings that Nailed Pinterest’s trend of 2019… Smoke Bombs! 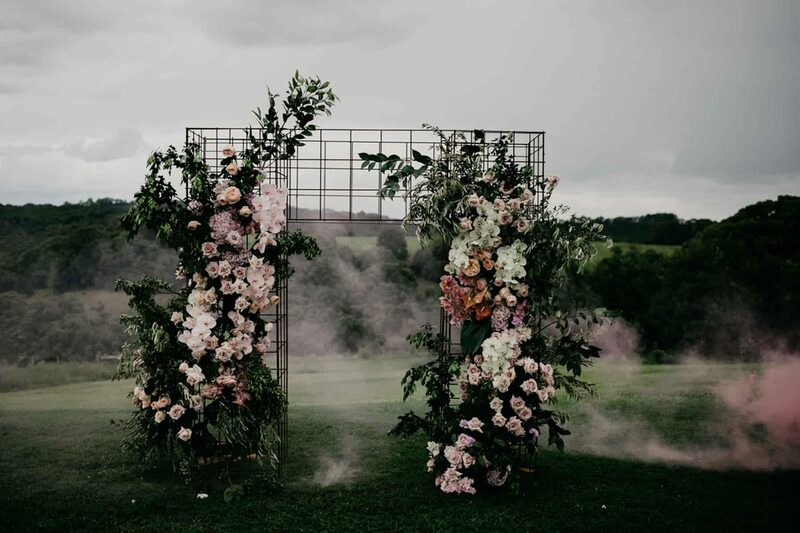 Whether you’re new to the wedding world or a veteran enthusiast, there’s not doubt you’ve stumbled on the smoke bomb trend at some point. 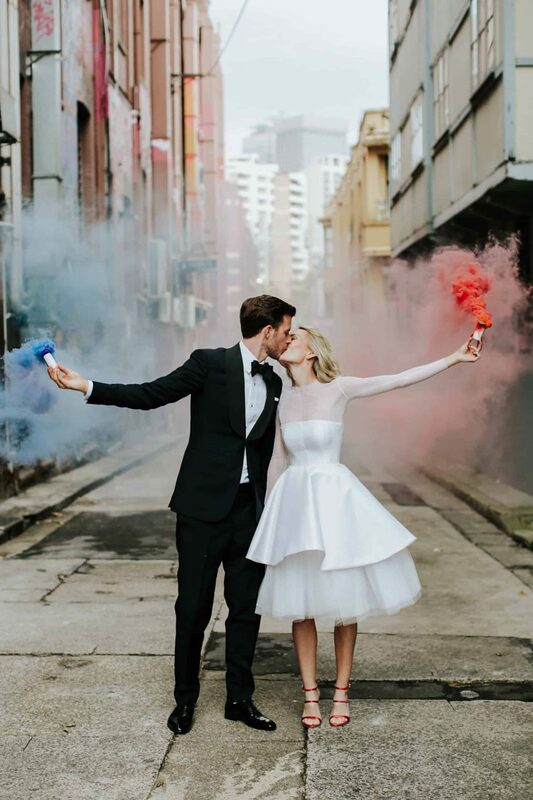 While it may seem a little ‘been there done that’, Pinterest has actually estimated smoke bombs to be a 2019 trend, revealing ‘smoke bomb photography’ searches are up by a massive 436%! 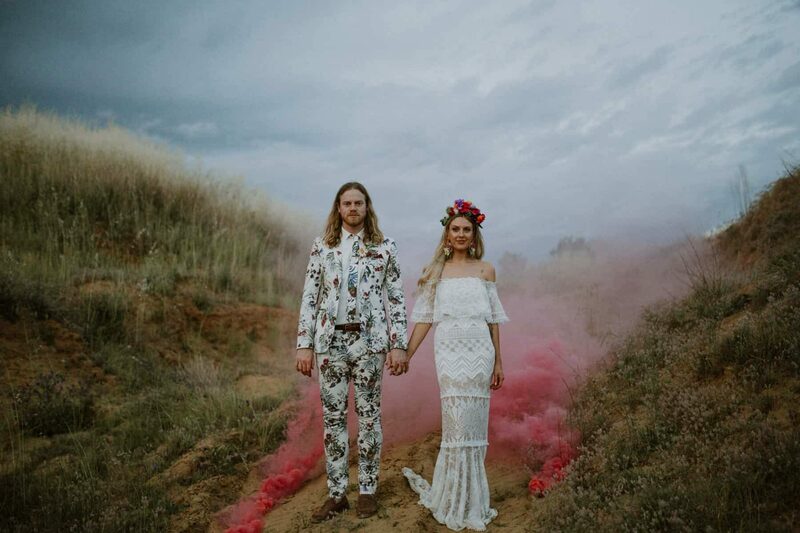 From a warehouse wedding to a mountain elopement, smoke bombs can add colour, depth and drama to your photography, resulting in some seriously powerful and vibrant snaps. 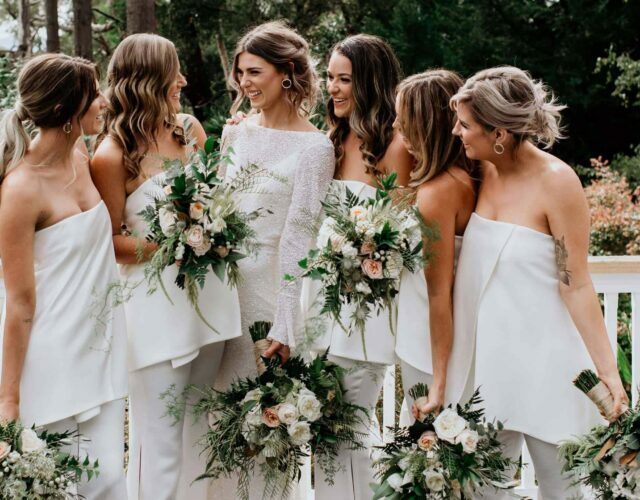 We gathered a handful of weddings that we think nailed the trend, and spoke to photographer Damien Milan about his thoughts and tips on getting it right. 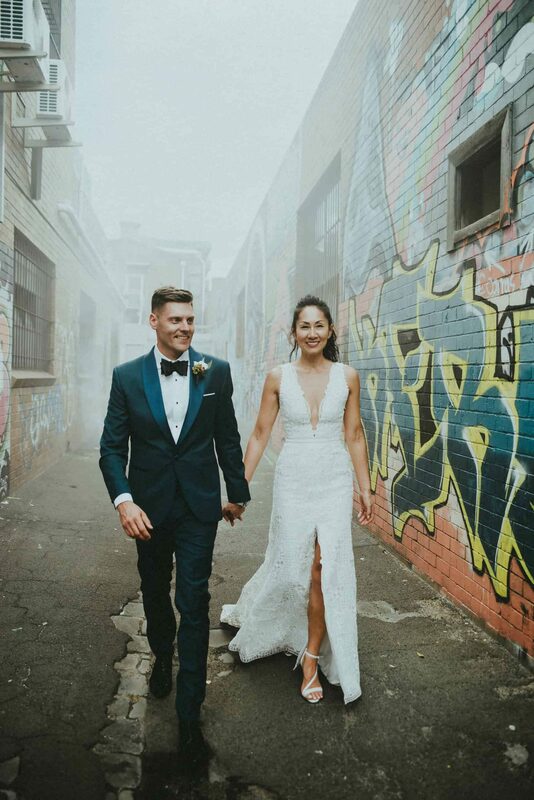 Damien, who captured one of our favourite smoke bomb images (above), says the moments that matter the most are often the real and simple ones. 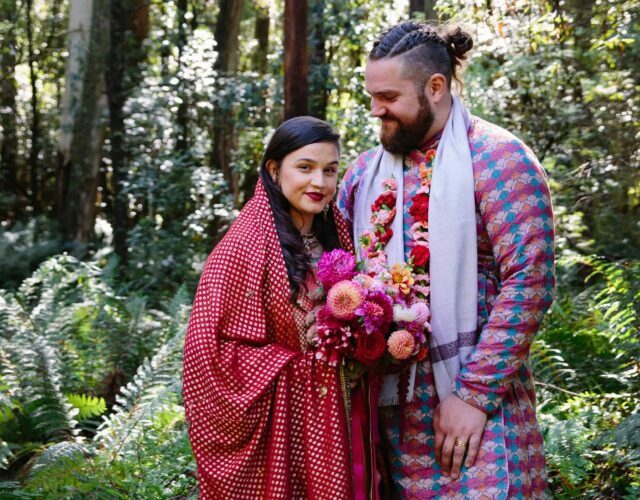 “My first advice would be not to overdo them and don’t let them distract you from the rest of the day,” he says. 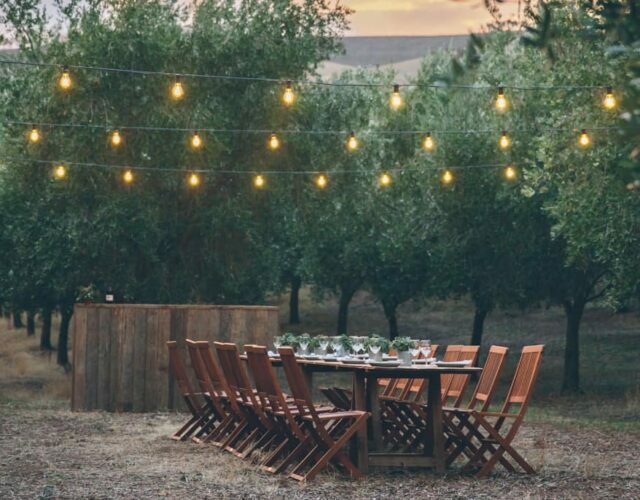 As for the best background to bomb, Damien says using them in city settings creates a nice contrast, but when it comes to an outdoor setting he likes to leave the scenery to nature. 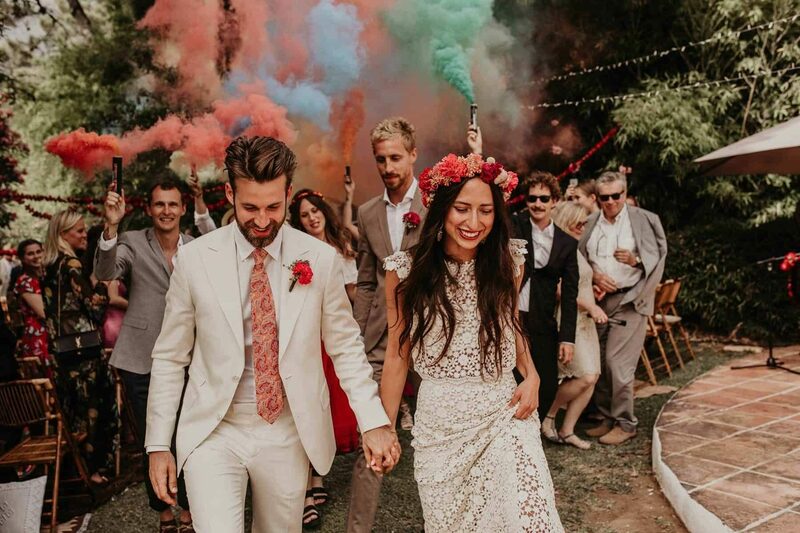 “I personally find smoke bombs too distracting [in an outdoor setting] and prefer to make the most of the natural elements that are already available”. 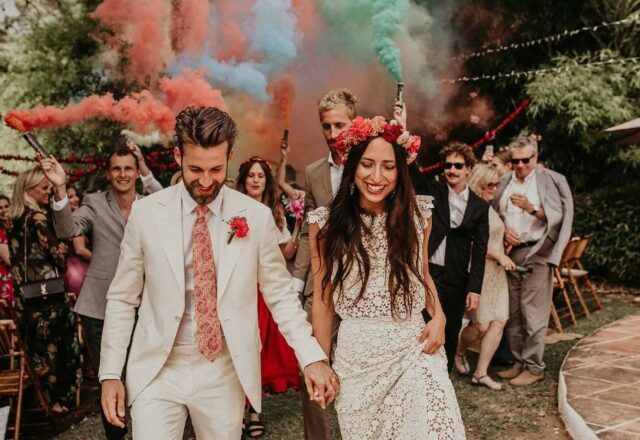 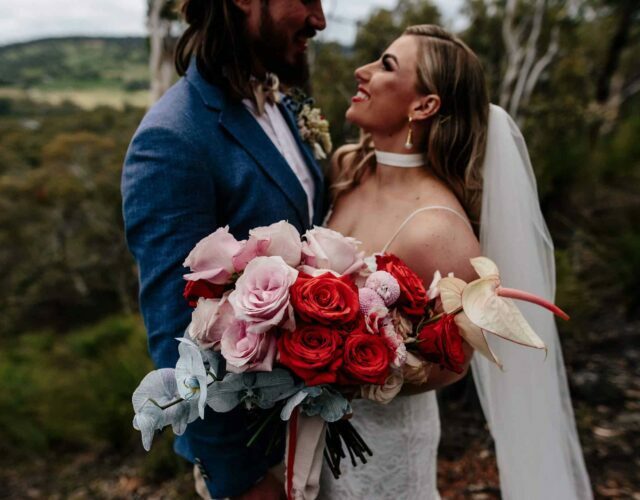 Although Damien assures us that coloured smoke doesn’t seem to have any affect on your wedding outfit, he does recommend keeping them at least an arm’s length away from your threads, and advises staying away from busy places or traffic. 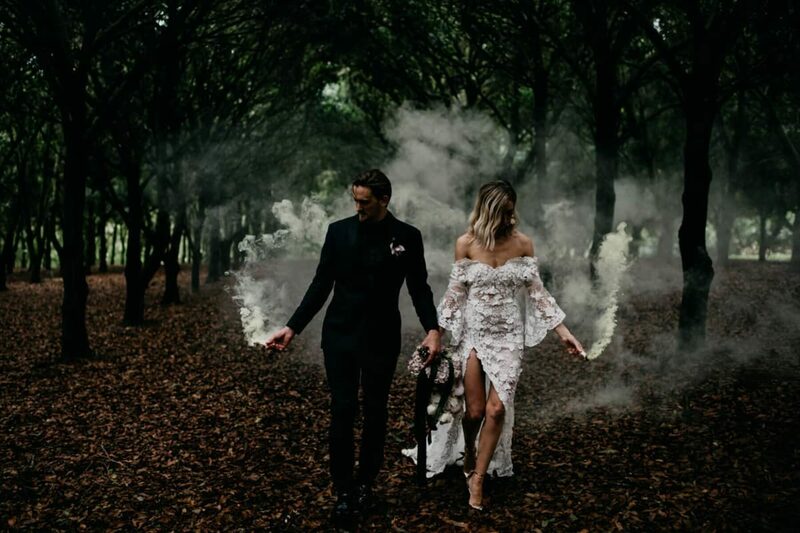 “Smoke bombs are a lot of fun when used in the right conditions…the last thing you want on your wedding day is to create a car accident,” he jokes. 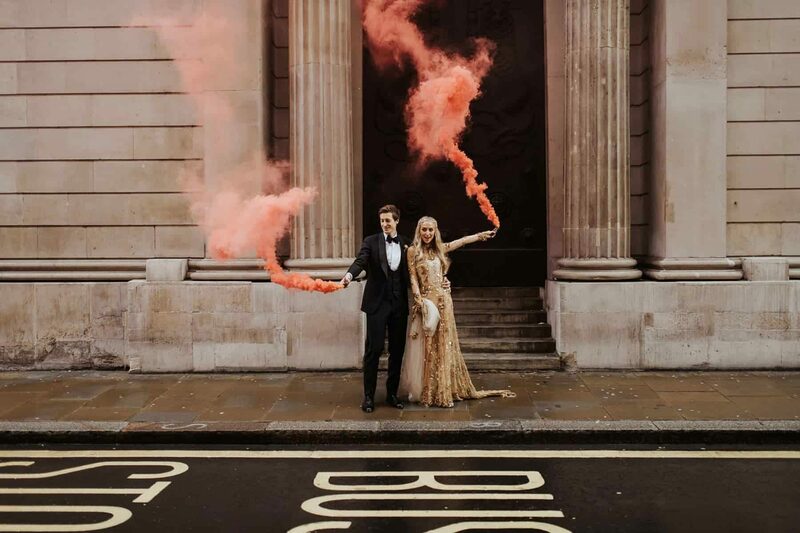 There’s no doubt 2019 will deliver even more epic smoke bomb photography, but for now you can find our top 12 smoke bomb weddings below. 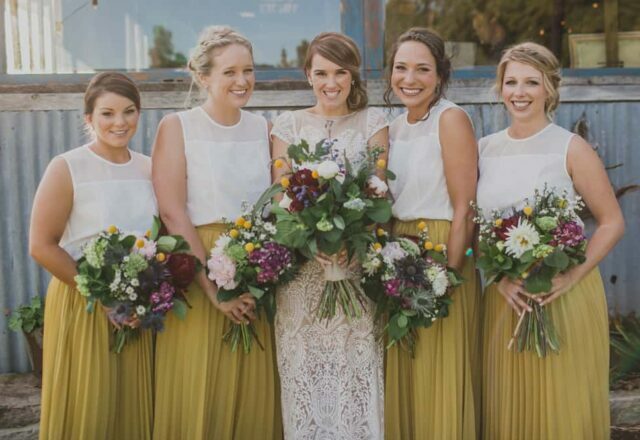 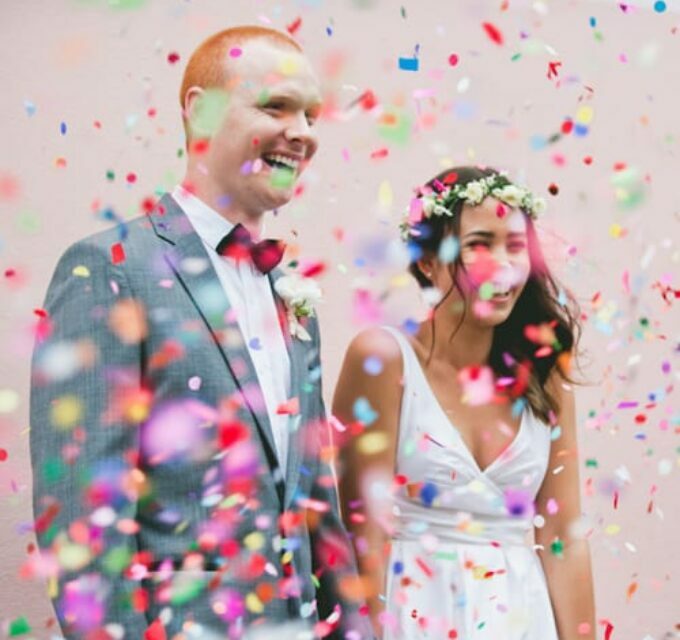 We shared Kat and Graham’s wedding a while back, when the smoke bomb trend was just emerging! 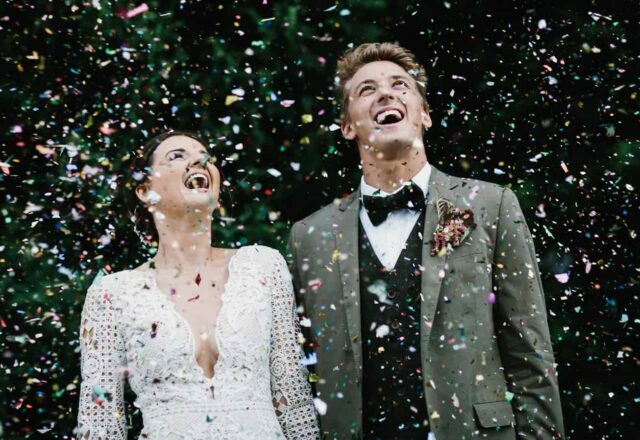 Photographer Lara Hotz is no stranger to a smoke bomb, and captured all the fun and drama of this epic Sydney wedding, which you can catch in full here. 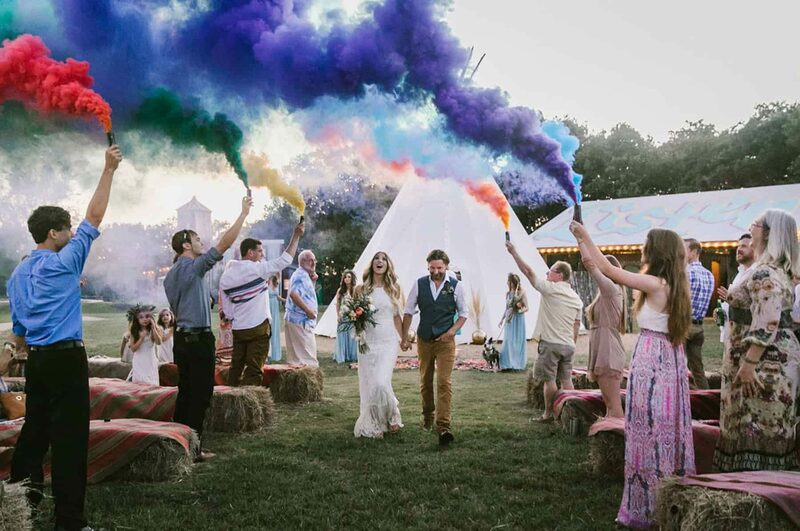 Instead of confetti, Kaitlen and Chad dialed it right up for their colourful smoke bomb ceremony exit, artfully captured by Briana Purser Photography. 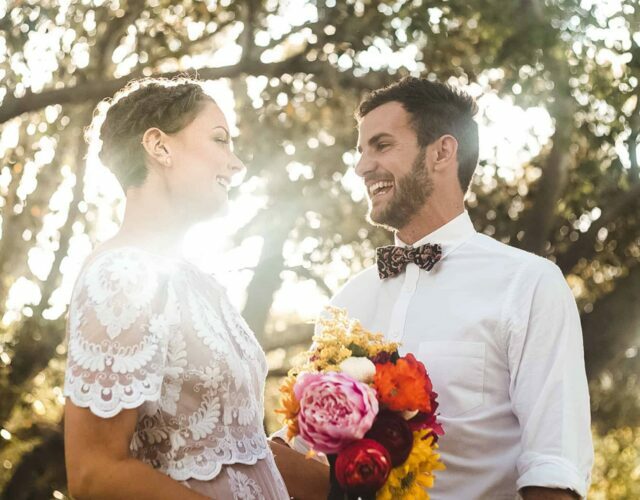 Bold and dramatic, we're absolutely digging these edgy frames by Flofoto. 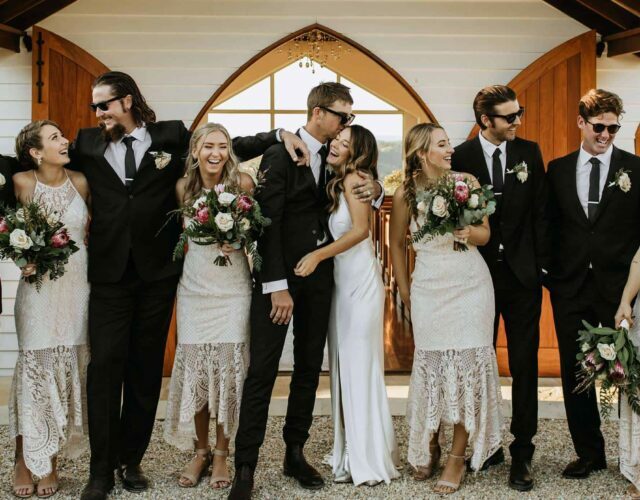 Derek and Mitchell's entire wedding was style central - check it out here. 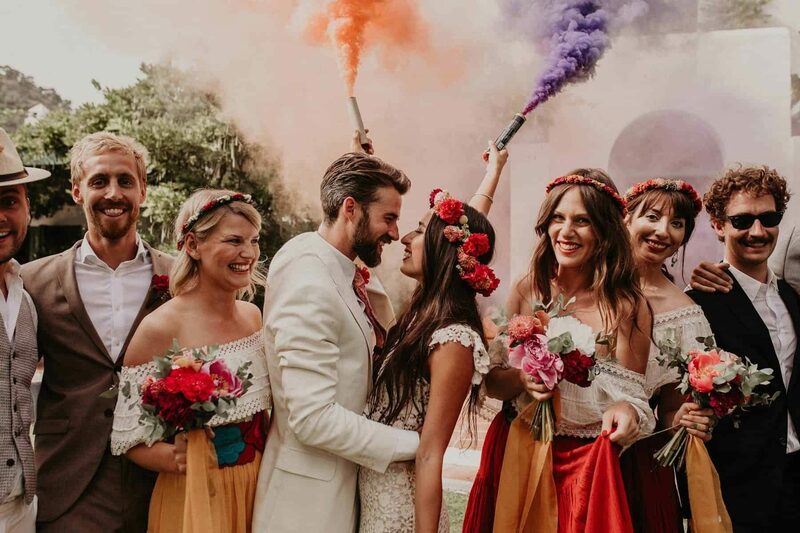 This quirky couple's vibrant wedding was perfect for a little smoke bomb action. 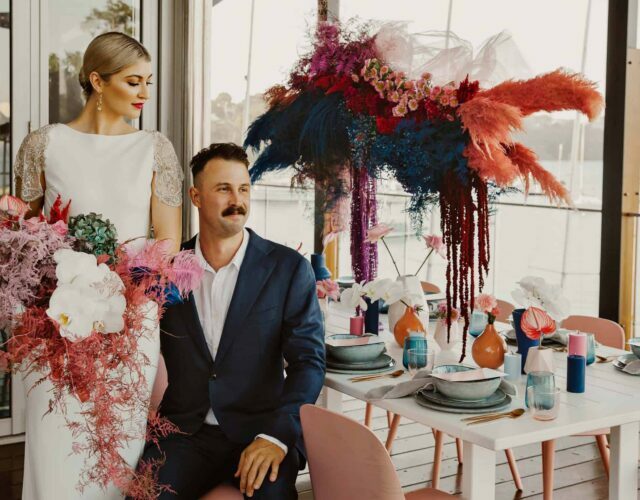 Elsa Campbell snapped all the colour and fun, which you can catch in full here. 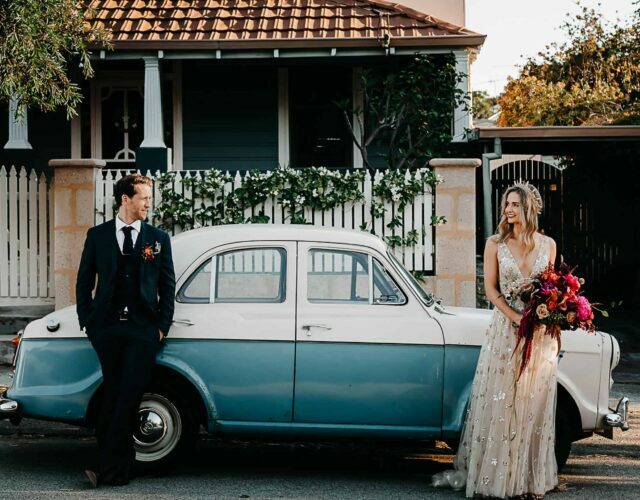 Captured by Joy Zamora, Elin and Oliver's wedding was one of our most popular of 2018! 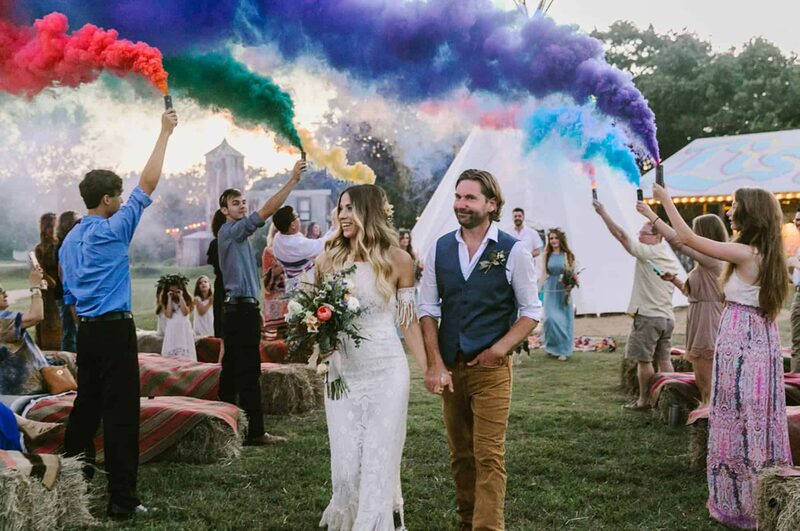 The creative couple opted for a rainbow of smoke bombs instead of confetti for the recessional... and it looked pretty epic. 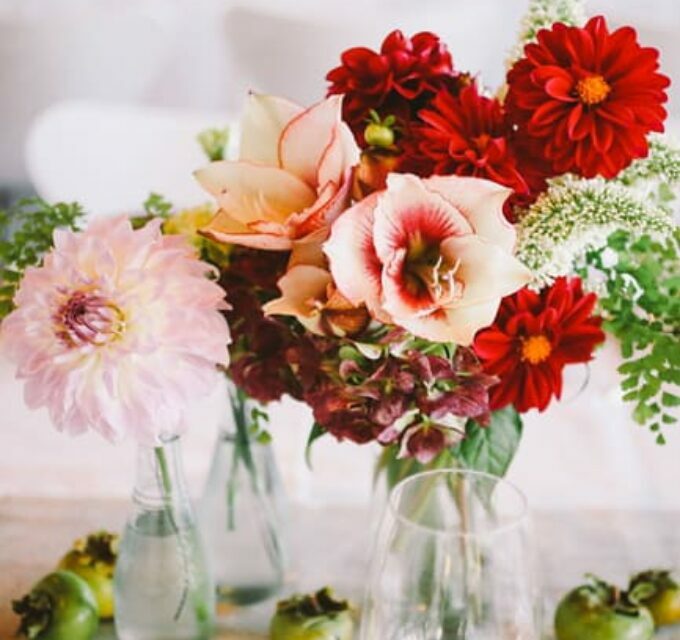 See the whole vibrant shebang here. 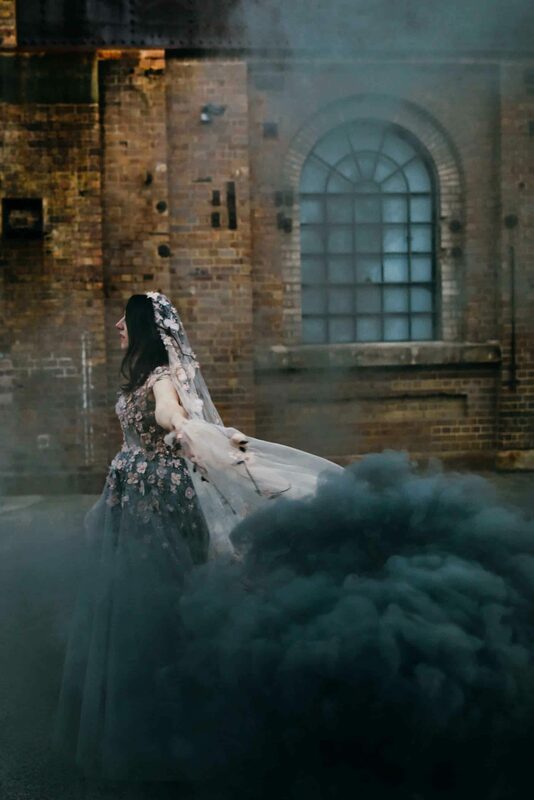 Photographer Lara Hotz nails it once again with these ethereal urban frames. 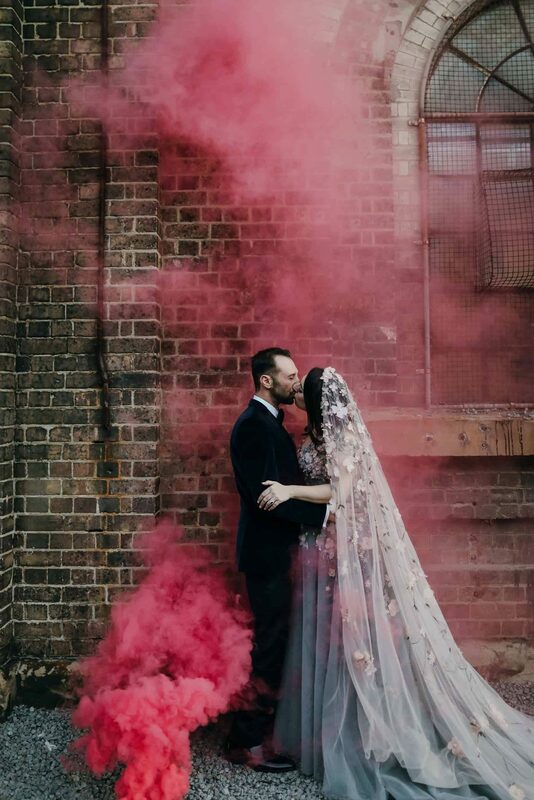 We're loving the contrast of pink plumes of smoke against the gritty urban backdrop. 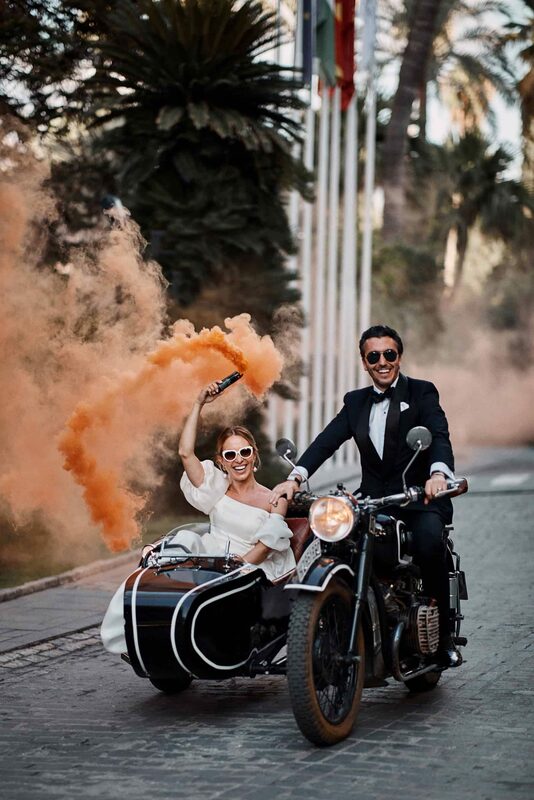 Channeling some serious James Bond vibes, these cool cats biked the streets of Seville with photographer Benjamin Wheeler. 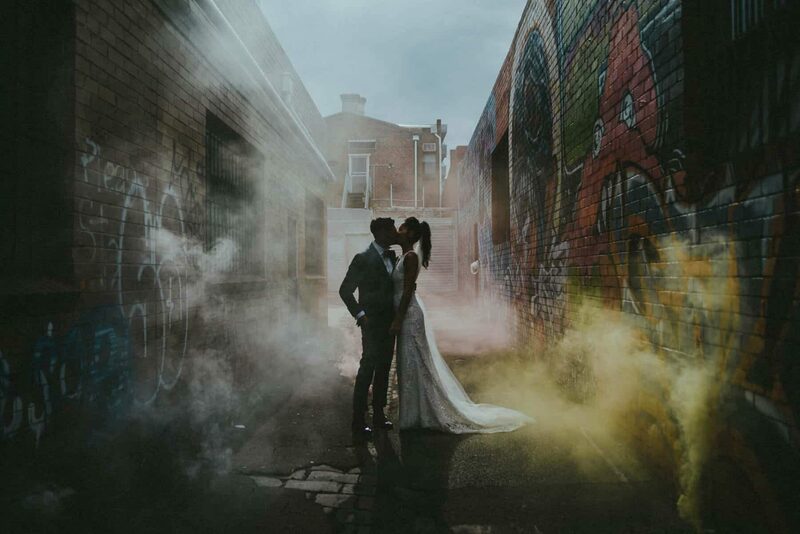 Moody and atmospheric, we're loving the subtlety of Tash and Pete's use of smoke bombs in Melbourne's laneways. 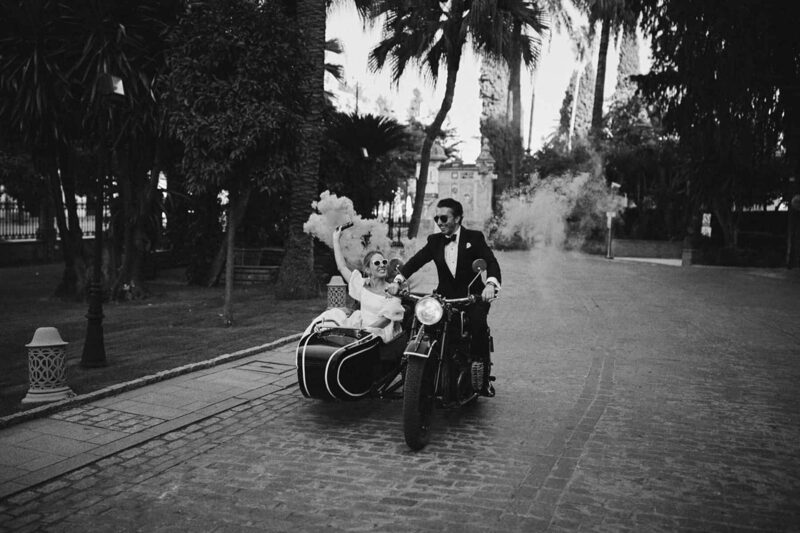 Tanya Voltchanskaya captured their industrial wedding, which you can see in full here. 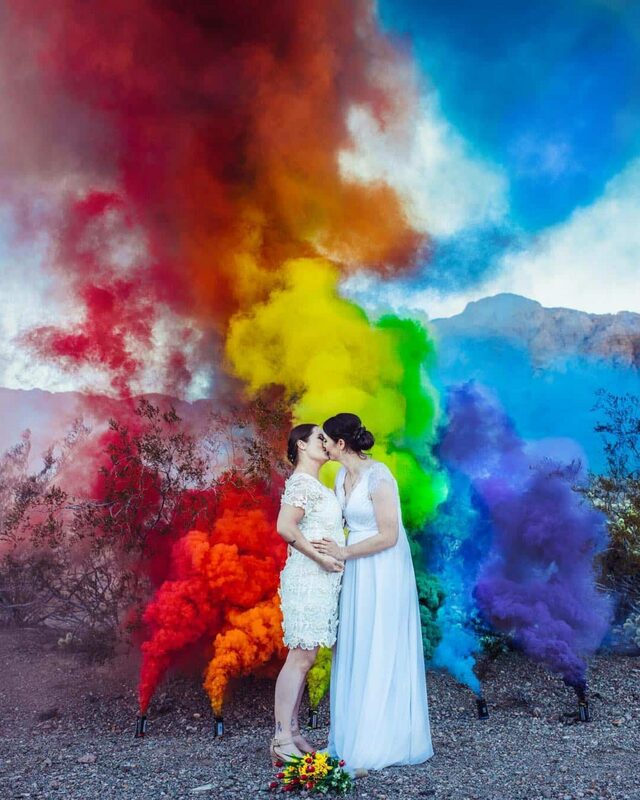 Flying the rainbow flag of love, these babes went all out for this epic frame. 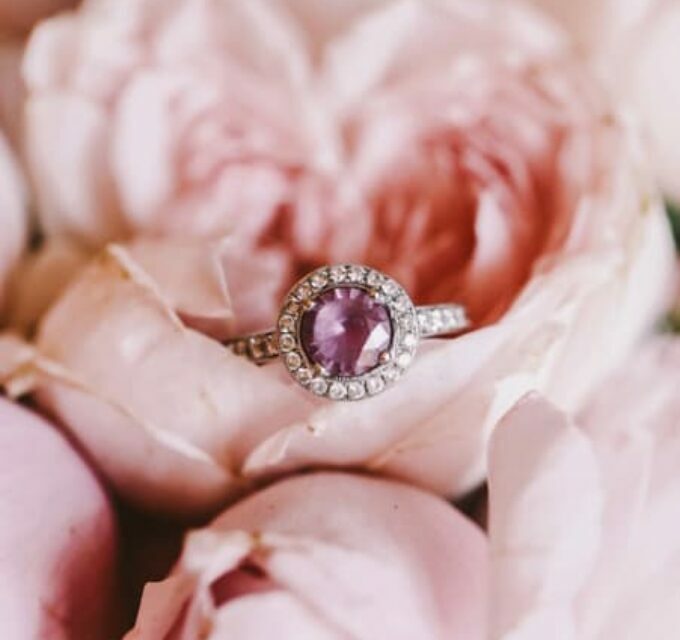 Incredible shot by Ashley Marie Myers.